Bring your own hats or helmets whenever possible. This is especially relevant to youth sports, as they are often part of a school team where equipment is provided. If it is within the sport’s rules and regulations, have your child bring their own hat or helmet. If you are unable to do so, then stash a bottle of our Prevention Spray bottles in their gym/sport bag to help prevent a lice infestation. Do not share anything that touches the head. This includes headbands, hair ties, sweatshirts with hoods, hats, headphones, etc. People are quick to share in order to help a friend and teammate, but unfortunately Leonard is sneaky and can travel from head to head quickly this way. Share information with teammates. There may come a time when your teammates wonder about why you won’t share a hat, or you brought your own helmet. Be open and share the facts about how head lice are spread through head-to-head contact very quickly. Leonard is very stealthy and makes himself hard to detect until it’s too late. Be extra careful in the locker room. Although head lice have a short life span off of the human head, there is still a chance for infestation in busy locker rooms. There is no need to avoid the locker room, but simply be aware and bring your own towels. 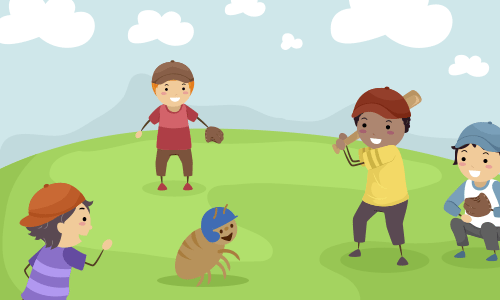 Before you suit up for kickball or bring the kids to soccer practice, take a moment to look at these tips for keeping Leonard the Louse off your team. He’s pretty sneaky but can only move around by either direct head-to-head contact or by sharing items that typically go on or touch the head. Playing sports is a great way to get exercise, enjoy the company of our teammates, and join in some healthy competition. If you discover head lice, however, remember that Pediatric Hair Solutions is nearby! We are experienced healthcare professionals that have years of experience helping families eradicate head lice infestations.